A few volunteers have recently asked some questions about taxonomy in Notes From Nature. This seems to be a big question that comes up as part of the herbarium interface since this is one of the two collections where volunteers are asked to transcribe the scientific name that is present on the label. giganteum is the specific epithet, sometime called species name. (Walter) Pers. is the authorship for the name. 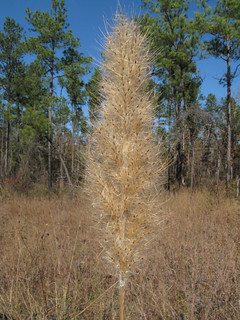 Saccharum giganteum is accepted by ITIS, but is not by Weakley’s Flora. Weakley considers Saccharum giganteum to be synonym of Erianthus giganteus while the opposite if true for ITIS. Both sources agree that the two names exist, but they have different opinions about which is currently accepted. We are very excited to see folks doing some research about these names. At Notes From Nature we strongly encourage our volunteers to learn more about the work that we do and hope that everyone learns something about museums and biodiversity as part of the process. Below are a few links where volunteers can look up more information about the different taxa that they encounter, but there is no need to include that information in the transcription or Talk page. However, there are at least two exceptions to this. First would be the discovery of a misspelling or typo. Any scientific names that you discover to be misspelled should be corrected in the transcription. The other would be if you have a question, concern, noted some other oddity on the label, or just want to chat about something you have seen.